Analysis and breakdown of Open Workout 18.3. Week 3 of the Reebok CrossFit Games Open brought us double-unders, overhead squats, dumbbell snatches, and ring and bar muscle-ups. Technically, the workout was 2 rounds for time, but with an aggressive 14-minute time cap, it turned into an AMRAP-style workout for all but two competitors—Dakota Rager and Josh Bridges. If you thought the 350 double-unders we saw in 17.5 were rough, this year Dave Castro upped the ante with 800 double-unders required to complete 18.3. Fortunately for our calves, the average competitor only had time to complete about 251 double-unders. Although we’ve seen some type of muscle-up every year in the Open, this was the first time we’ve seen both types of muscle-ups in the same workout. And to the disappointment of many proud bar muscle-up aficionados, you had to get past the 12 ring muscle-ups (and 440 other reps) to get to the pull-up bar. It was more accessible than 15.3, though, which opened with 7 ring muscle-ups. Among competitors aged 18-34, 77 percent of men and 57 percent of women attempted the Rx’d version of 18.3, compared to 89 percent and 71 percent last week, respectively. Ring muscle-ups are one of the most challenging movements we see in the Open and always prove to be a roadblock for athletes. This year was no exception. While an impressive 72 percent of Rx’d men got at least one ring muscle-up during 18.3, only 26 percent of Rx’d women accomplished the same. Most of the athletes who couldn’t perform ring muscle-ups ended the workout with 220 reps, which is as far as you can get without them. Ultimately, 53 percent of women and 16 percent of men ended the Rx’d workout with 220 reps. 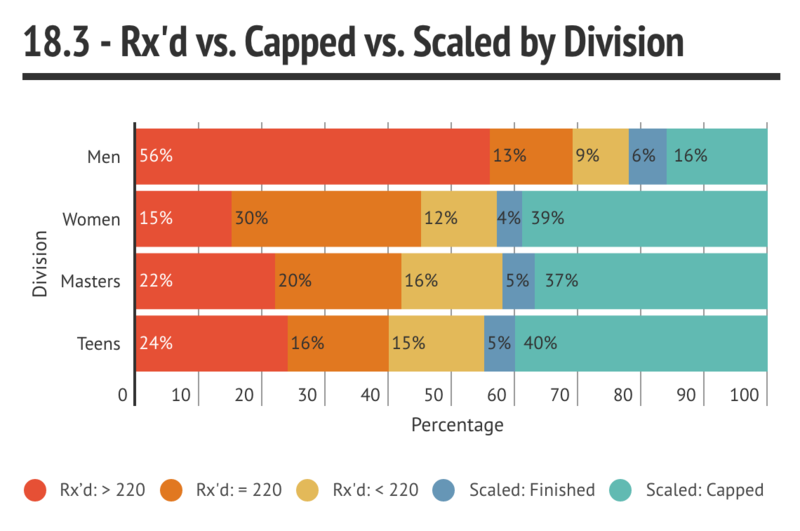 The chart below gives a breakdown of who performed the workout as Rx’d and how many reps they performed, as well as a breakdown of who attempted and finished the Scaled version, separated by division. Finishing this workout was nearly impossible. Just getting past the first round is pretty impressive. 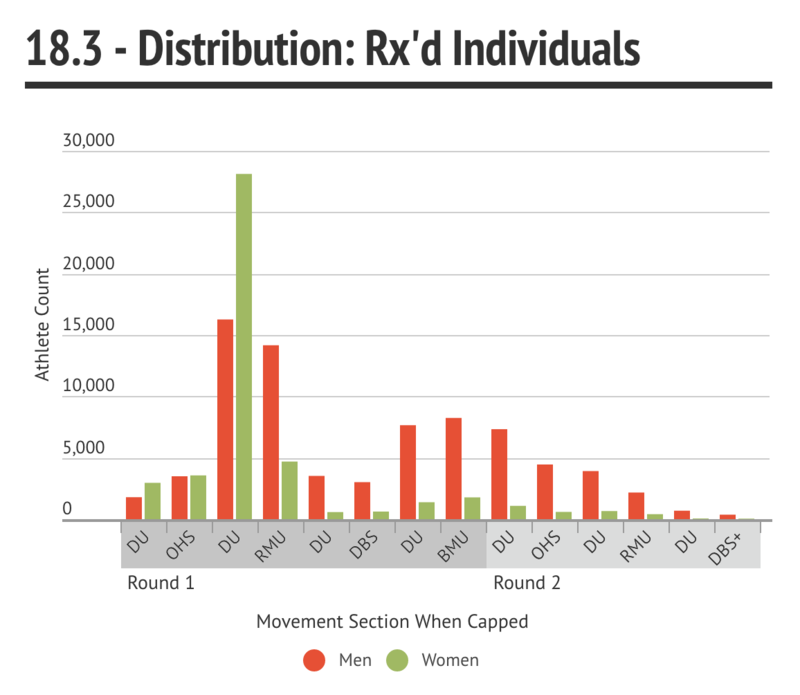 Only 25 percent of Rx’d men and 6 percent of Rx’d women made it into Round 2. The chart below gives the distribution of Rx’d scores based on the movement the athlete was on when the time cap hit. You had to get at least one rep in the next movement section to be included in that grouping. The giant spike during the second set of double-unders includes all the athletes who were either still working on their double-unders or finished them but didn’t get a ring muscle-up. For the women, we see that the big roadblock was the ring muscle-ups. For the men, we see a big group that got some ring muscle-ups but not all of them. There also is a nice distribution of scores for the men centered on the bar muscle-ups at the end of Round 1. These were athletes who could perform all the required movements, and the differences in their scores came down to movement proficiency and work capacity. Below are the percentile tables for all divisions on 18.3. You can see the breakdown of what time and/or reps it took to achieve a particular percentile for your division. Times in gray are the finish times for the workout, and times in green are the tiebreak times for athletes with 220 reps. For example, for Rx’d Women (18-34), you needed 220 reps with a tiebreak time of 6:27 to get into the 50th percentile. On the left side of the table, you can see the percentage of athletes who did the Scaled version of the workout in each division. 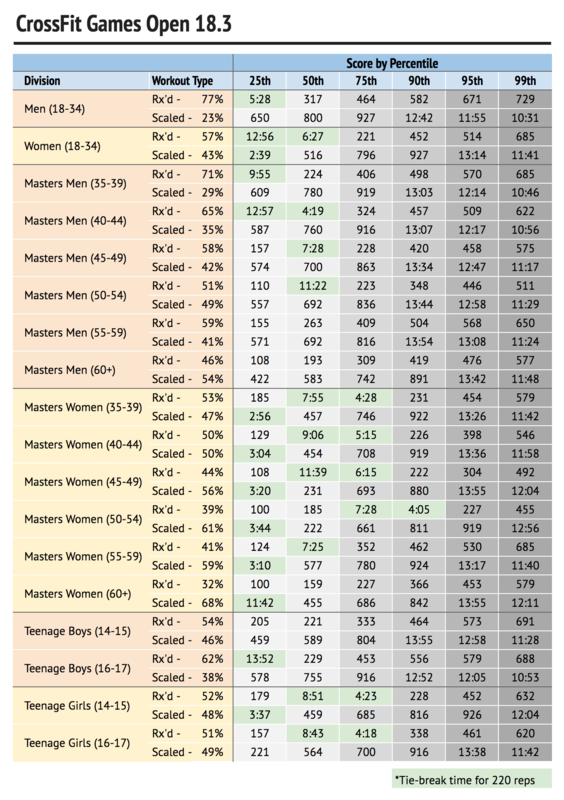 The percentile tables are calculated by comparing each division and version of the workout. This differs from the percentiles you’ll see in the CrossFit Games app, which shows you your overall percentile in your division against both Rx’d and Scaled competitors. BTWB is the official CrossFit® workout-tracking app. Log, plan and analyze your WODs with friends at your CrossFit® box and around the world. All plans come with a 30-day free trial.